The day started with a wonderful breakfast made for us by Don and Joanne, a couple from the Discovery Baptist Church at 5:45 am. Thank you Don and Joanne!!! We were all moving a little slow after the 223 km ride yesterday. Then we met MP Andrew Scheer. Andrew started cycling with us at about 8 am and accompanied us across his riding from Regina to Wolseley, about a 100 km ride then joined us for lunch. His staff contributed to a fund called “Make Your Boss Sweat” and that money was donated to our Cycling4Water goal. We did make him sweat. Big thank you to Andrew’s staff. It was a great day for riding, no too hot and no wind or a slight tail wind. We stopped in McLean, the highest point on the CP rail line east of the Rockies! That’s why it felt like an up hill climb out of Regina. Eastern Saskatchewan has long rolling hills. Andrew gave us a running commentary of the area and answered all my questions about what it is like to be the speaker of the house and his role as a local MP. Great time and a good ride. Here we are at Wolseley. Andrew issued an open challenge to all other MP’s on our route to ride along with us through their riding. Thank you Andrew for your encouragement and taking the time to ride along! We said good bye and headed to our destination, Whitewood, SK. 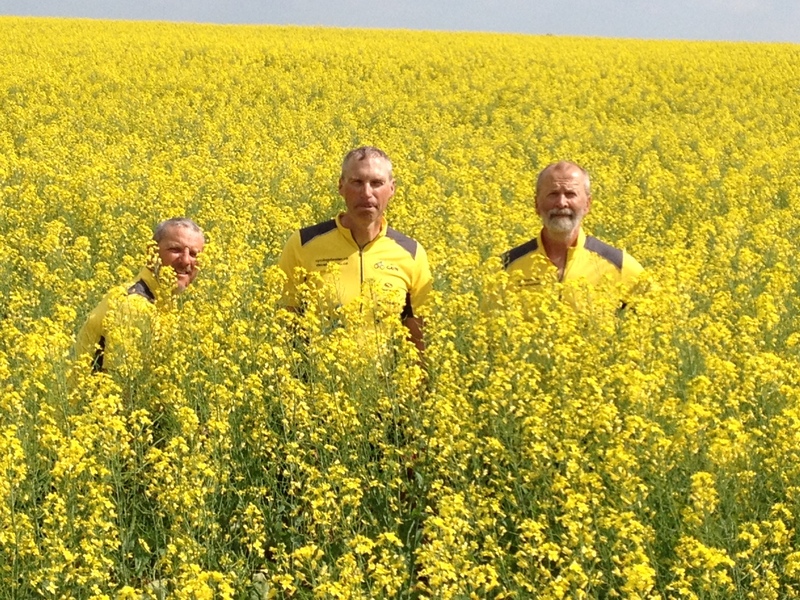 Richard, Rob and Timo are checking to see if they could “blend in” with the canola blooms in one of the many canola field we passed. Not bad. We arrived in Whitewood at about 6 pm to a wonderful dinner followed by a presentation at the New Covenant Fellowship. The group was small but the dear folks gave generously toward a well! They heard it was Timo birthday this week and had a cake for him. Thank you for sending me the blogs, I am amazed at the distances you are travelling and the pressure you go through to meet media and politicians, well done all. Timo, keep riding buddy you look great in yellow.